Below there is a list of my backpacking treks abroad with the corresponding Google Earth files showcasing the routes and short fly-over videos. The routes shown within the files only refer to those times when I am moving with	my fully loaded backpack, neglecting the twice daily forays from camp (sometimes significant, others brief) I do at sunrise and sunset with the camera hanging from my neck and the tripod on my hands. The Google Earth files also include icons showing the start and finish of the route, the campsites, and those locations I reached on hikes from camp without my backpack. TOMBSTONES, Yukon Territory, Canada (September 2017, five nights). Enjoying life in one of the most beautiful settings this planet has to offer: the jagged serrated peaks of the Ogilvie Mountains in peak tundra fall season. Paradise on Earth. The weather could have been better, but also a lot worse. BOCK LAKE, Yukon Territory, Canada (August 2017, two nights). 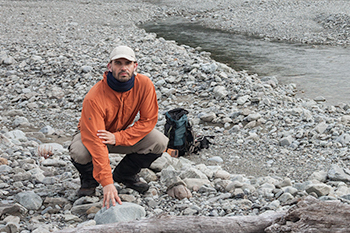 A beautiful and lonely trek along the full length of the Bock River, from its mouth at Kluane Lake to its birth way up of the crest of the Boundary Range. The primeval views from the day hikes close to the lake have to be prime examples of what the world looked like before we came to mess it up. OBSERVATION MOUNTAIN, Yukon Territory, Canada (August 2017, three nights). A long and endless trek with a single objective: stake my tent in full sight of the snake-like Kaskawulsh Glacier for one of those "I'm king of the world" moments. I will also remember my socks frozen solid at sunrise from the creek crossings the day before (obviously my boots were also frozen, but that had happened before). TORRES DEL PAINE, Patagonia, Chile (March 2017, one night). A tremendous trek to spend the night at the base of the vertical south face of the Torres del Paine, at what is without doubt one of the most impressive (and exposed) places I have ever camped at. LOS GLACIARES, Patagonia, Argentina (March 2017, six nights). A full week within sight of either Fitz Roy or Cerro Torre, two of the mightiest mountains on the planet. The days went quickly looking for photo opportunities, while sunrises and sunsets went even quicker. I was either pressing the shutter or blaming the weather gods. DIENTES CIRCUIT, Navarino Island, Chile (March 2017, four nights). A circumnavigation around the rugged Dientes (Teeth) de Navarino, fully exposed to the wild Patagonian weather, in what is supposedly the southernmost trail in the world. Intended as a test of my ankle surgery eight weeks earlier, I passed the test with high grades. 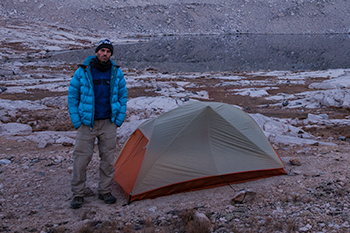 SOUTHERN SIERRA HIGH ROUTE, CA, USA (September 2015, seven nights). Eight days to traverse the highest section of the Sierra Nevada staying as close as possible to the crest, including an ascent of Mount Whitney. With a total of 79.0 miles (20.0 off-trail) and 23900 feet of elevation gain, this was my introduction to high routes with significant cross country travel. I loved it and as you can imagine, I now have several projects in the pipeline. SEVEN LAKES BASIN, WA, USA (July 2015, three nights). A beautiful foray into a popular area of the Olympic Mountains, spiced with a cross-country climb of Cat Peak. Mount Olympus is named that way because somebody thought such a beautiful mountain could only be the residence of the gods. Watching sunset from up here, right in front of it, it was damn difficult to disagree. POINT OF ARCHES, WA, USA (June 2015, one night). A short walk on the beach to reach one of the most beautiful corners of the Olympic Coast. EXIT GLACIER, AK, USA (August 2014, one night). A tough climb with a worthy reward: sleeping with the stars above and the Harding icefield below. KACHEMAK BAY, AK, USA (August 2014, one night). A glorious trek along the the crest of a ridge with wonderful views of the fjords way down on both sides. I will never forget watching the bald eagles (too many to count) gliding so close to me without moving a muscle. KESUGI RIDGE, AK, USA (August 2014, one night). Fed up of too many days of non-stop rain, I decided to go backpacking anyway. The rain continued, but it is way better to camp alone in the tundra in the middle of nowhere, than to wander from town to town with nothing to do. It felt like a liberation. ANDERSON PASS, AK, USA (August 2014, four nights). Big glaciers, lots of bears, strong winds (I would say gales), and the mountain always there. I paralleled the lower reaches of Muldrow Glacier as it flows northeast from Denali, and then climbed to Anderson Pass on the crest of the Alaska Range. Unforgettable. ICEBERG VALLEY, AK, USA (August 2014, four nights). After being air dropped, I explored a remote valley within the Saint Elias mountains surrounded by enormous glaciers and ice fields on all sides. Luckily for me, I was also air picked a few days later. TABURIENTE CALDERA, La Palma, Canary Islands, Spain (April 2014, two nights). A spectacular setting swallowed by the volcano in the best company, with huge cliffs surrounding us on all sides. INNER GRAND CANYON, AZ, USA (December 2013, five nights). Unforgettable views and unforgettable cold getting away	from it all below the rim, enjoying the	solitude and grandeur of the inner Grand Canyon. IMAGE LAKE TRAIL, WA, USA (July 2013, five nights). A long trek within the wilderness of the North Cascades to admire the reflection of Glacier Peak onto Image Lake. Crampons, ice axe, beautiful flowers, and lots of flies. 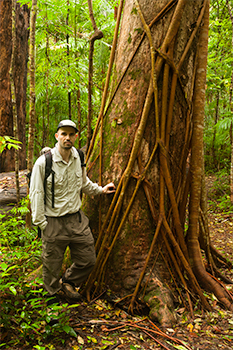 CORCOVADO TRAVERSE, Costa Rica (March 2013, two nights). An exciting trip crossing the tropical rainforest	of the Osa Peninsula enjoying most of its amazing wildlife (tapirs, peccaries, birds, crocodiles), and trying to get rid of the rest (ticks). CERRO CHIRRIPO, Costa Rica (March 2013, one night). A tremendous climb through the cloud forest until I left the clouds and the forest below, followed by an extremely early wake up to continue climbing in the dark. The regard, sunrise at the top of Costa Rica, with the Atlantic Ocean on one side and the Pacific on the other, both visible but way way down. MONTE VERDE, Costa Rica (March 2013, one night). A wet guided walk along the glorious cloud forests for which Costa Rica is famous to sleep at an isolated cabin deep within the wilderness. THE NEEDLES, UT, USA (October 2012, one night). 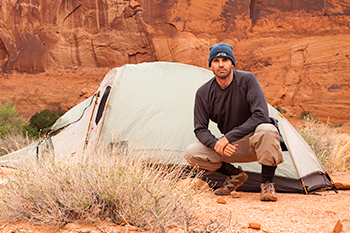 A quick one nighter to sleep at Chester Park and visit the enormous Druid Arch, one of the most beautiful of the Colorado Plateau, and that I could finally cross off my agenda. PHIPPS WASH, UT, USA (October 2012, two nights). 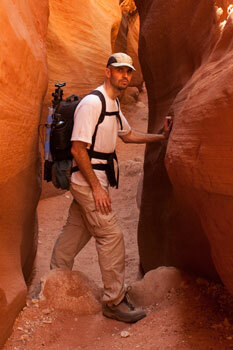 Another of those difficult to beat trips within the Escalante Canyons. I will never forget the downpour of the first day, the smell of the wet desert, and how water started flowing down from everywhere into the canyons, from trickles to torrents to short lived raging rivers. It did not last long, but I keep it memorized deep inside me. COYOTE BUTTES, AZ, USA (October 2012, one night). A few hours of flat, sandy, featureless hiking under the desert sun, dropping a couple of half gallon bottles of water for the return trip, to reach one of those spots of the Colorado Plateau whose beauty is beyond comprehension. LARAPINTA TRACK, NT, Australia (May 2012, eight nights). 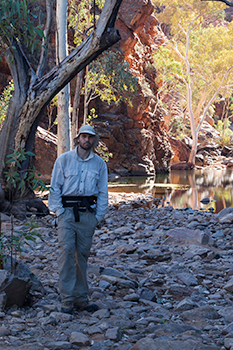 A tough as hell, dry as hell, hot as hell walk along the desolate spine of the MacDonnell Ranges in central Australia, moving from waterhole to waterhole under the relentless sun. Many of the 86.3 thirsty miles were an ordeal, but a few rank up there with the best. ARTHUR'S PASS, New Zealand (March 2012, two nights). Low clouds and nearly continuous rain. The valleys were beautiful, and I guess the mountains too, if I could have seen them. CASCADE SADDLE, New Zealand (March 2012, three nights). A wonderful traverse through one of the most beautiful spots of the Southern Alps. Crazy weather, spectacular glaciers, raging torrents, difficult to beat. HAVASUPAI, AZ, USA (October 2011, one night). A short trip to admire the beautiful waterfalls and travertine pools formed by Havasu Creek before reaching the Colorado River within the Grand Canyon. COYOTE GULCH, UT, USA (October 2011, one night). Two days, which I enjoyed as if they were ten, along a beautiful tributary of the Escalante River. Natural arches, glorious canyon scenery, natural bridges, alcoves, cottonwoods, waterfalls, beautiful light, ... , quite close to my view of the garden of Eden. FREYCINET, TAS, Australia (March 2011, one night). A trek to camp with a perfect view of the golden beaches and emerald waters of Wineglass Bay, on the sunny Eastern side of Tasmania. SOUTH COAST TRACK, TAS, Australia (March 2011, six nights). Water, mud, and more mud along the remote, wild, and wet southwestern coast of Tasmania. I learned to enjoy the wild weather, learned the meaning of waist deep mud, and learned to fjord creeks that I would not have even thought possible a few days earlier. BEAR LAKES BASIN, CA, USA (August 2009, four nights). A foray to the magical alpine world of the Sierra Nevada, with sunny days, crispy nights, and lots of clear frigid lakes for choosing campsites. NEON CANYON, UT, USA (April 2008, two nights). Non stop hiking sometimes along, most within, the cold waters of the Escalante River, with the added bonus of reaching the glowing alcove of Neon Canyon and its two perfectly located ceiling holes. SOUTH OLYMPIC COAST, WA, USA (September 2007, three nights). An easy going trip admiring the sea stacks,	tide pools, and wild beaches of the South Olympic coast. ALPINE LAKES, WA, USA (August 2007, six nights). A week of mostly wet weather among the many beautiful alpine lakes of the Central Cascades. I luckily ended up convinced that the landscape was as beautiful as the waterproofness of my tent. LAGO TORRE, Patagonia, Argentina (December 2006, one night). My first contact with the fiery winds that come down from the Patagonian icefields, trying to get a glimpse of the icy mushroom on top of mighty Cerro Torre, with little success. GARNET LAKE, CA, USA (August 2006, three nights). A nice camping trip to one of the most scenic spots of the Sierra Nevada, with Banner Peak always in sight and a multitude of lakes to enjoy. ENCHANTMENT LAKES, WA, USA (September 2004, four nights). A few days at likely the most beautiful basin in Washington State, hoping from lake to lake under the first snowstorm of the season, just when the larches were turning yellow. MOUNT JEFFERSON, OR, USA (August 2004, one night). A quick one nighter to a beautiful alpine meadow full of flowers, right below the mighty volcano. OLYMPIC COAST, WA, USA (July 2004, five nights). A beautiful trek along the full length of the magnificent northwestern coast of the Olympic peninsula, hiking both on beaches and coastal rainforests, and enjoying the ocean's salty scent and its wildlife. CHILLIWACK RIVER, WA, USA (July 2004, five nights). A difficult trip within the remote wilderness of the North Cascades. My first long trek, the heaviest pack I have ever put on my shoulders, the first and last time (for sure) I have been afraid of bears, and also the first and last time (also for sure) that I have been completely lost in the backcountry. PARIA RIVER, UT, USA (September 2003, two nights). Three days inside the vertical cliffs of the mother of all desert canyons, a location of unsurpassed beauty and grandeur.